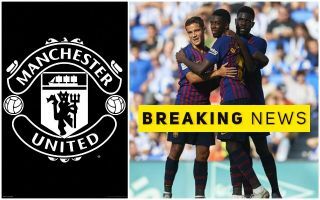 Manchester United have opened talks over a shock transfer swoop for Barcelona outcast Philippe Coutinho. The Brazil international only joined the Catalan giants last year but is widely reported to be unsettled after a lack of impact since his move from Liverpool. The Reds have been linked with a move to re-sign Coutinho, but CaughtOffside understands other big clubs have been placed on alert. Manchester United, Chelsea, Manchester City and Paris Saint-Germain are among those interested in Coutinho should he leave the Nou Camp. However, CaughtOffside understands United have moved to steal a march on their rivals by making early contact with Barca with an enquiry over the 26-year-old. It remains to be seen if the former Liverpool man would be prepared to make a move to a bitter rival like United, potentially destroying his reputation at Anfield forever. Still, it’s easy to see why the Red Devils are interested in Coutinho, who was world class in his time in the Premier League, and who could make an ideal replacement for the struggling Alexis Sanchez. It is expected that Coutinho would cost around £100million to bring back to English football. The South American could also be a quality addition for Chelsea as they face losing Eden Hazard to Real Madrid in the near future, while he could also be a fine fit for Pep Guardiola’s City.